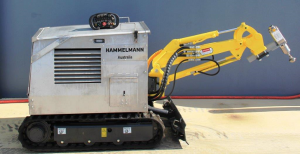 Hammelmann Australia’s remote controlled Aquadozer is safe to use for large scale product removal in confined spaces. Designed and manufactured locally to suit Australian industry requirements. The unit can handle reaction forces generated by a 800 kW Hammelmann pump. Click here for product features.